image from page 10 of Pan American Air Ways, supplement entitled"Bringing the World to Your Door", 1938. Caption reads: "A Pan American airliner soars on certain wings over the lofty Andean peaks and a toilsome journey of days becomes a matter of scenic hours." 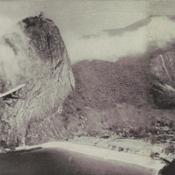 Pan American World Airways, Inc. , “Photograph of a Pan Am Clipper flying boat traversing Sugar Loaf Mountain as it lands in Rio de Janeiro circa 1938,” UM Libraries Digital Exhibits, accessed April 22, 2019, http://scholar.library.miami.edu/digital/items/show/1747.